I made these cute little Leprechaun hats quite a few years ago. You may have seen these pretty little spring bonnets made from shrunken foam coffee cups that I posted previously as well. These are really fun and super cute, they make a great party favor or just a fun craft for the kids. 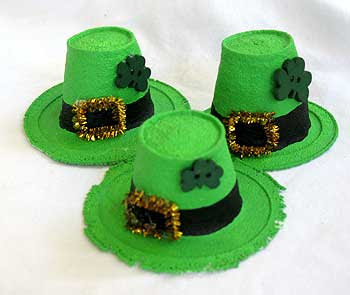 Get the kids together and have some fun making these miniature leprechaun hats! Note: The temperature and instructions in this craft are based off of a dark coated cookie sheet at 250 degrees F in an electric oven. You may want to experiment with different temps until you receive satisfactory results. I recommend baking one or two cups at the recommended temperature and time first. If they seem to melt too quickly or the ends curl up and under, try reducing the temperature and trying again. 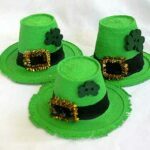 Note: Instead of the buttons, you can either paint a shamrock on by dipping the eraser of a new pencil into dark green paint and dotting it onto the hat three times, or cut your own out of felt or craft foam. Place Styrofoam cups upside down (open end of cup down) on a dark coated cookie sheet, placing them about 1-2" apart. Note: we experimented with both dark coated and silver cookie sheets, the cups did not melt properly on the silver sheets. Bake in the oven for approximately 3 minutes, don't walk away! It will take about one minute before you see any changes to the cups, then the heat will begin to melt and shrink them rather rapidly after that. It's lots of fun for the kids to watch, so be sure to turn the oven light on. Remove the cookie sheet from the oven and set aside to cool completely. DO NOT try to remove the cups from the cookie sheet until they are completely cooled. As they cool, the Styrofoam that is stuck to the sheet will relax and release its grip from the sheet, allowing you to remove them easily. Most cups will melt rather well, thought you may end up with one or two that look rather distorted or disfigured. Paint the "hats" with green paint, one coat is usually enough, and allow them to dry completely. Once they are dry paint a black rim around the hat and allow to dry again. Mean while, take a gold chenille stem and bend it into a square or rectangle for the hat's buckle, trim end off with scissors. When paint is dry, hot glue the buckle to the front of the hat on the black rim. Hot glue a shamrock shaped button to the top portion of the front of the hat. If you like, you can hot glue a small round magnet to the bottom of the hat at the brim and hang on the refrigerator. If you are looking for fun St. Patrick’s Day crafts, try my Pot of Gold Greeting Card or my Welcome Shamrock! you can also make little easter baskets out of the melted cups. use a pipe cleaner for handle and decorate as you like . Just had to comment on these. and I took a look at the spring ones. I worked for the County in one of the Senior Centers and we did a Voluntier Banquet with the theme of " Hats off to our Voluntiers". This was 7 years ago. I did many of these up and took them into the center and the ladies decorated them. They had so many cute ones. We sat them on our nut cups on the tables. They looked adorable.We had one lady that had worked as a milinary making hats when she was younger. She did a beautiful job on hers. It was so much fun working with these ladies and making these. We also used my moms hat collection in the line of decorating. Funny as I pulled out of the yard at mom and dads dad hollared and said don't bring them back. LOL I now have hat box upon hatbox of hats.